Question: Do you know someone from a different country in your neighborhood? What are ways you can bless them? You can leave a comment by clicking here. We also discuss people’s calling to the global mission field and how they can prepare for their calling. He also answers the hot topic question, How can we go to other countries for missions, when we have unmet needs in our own cities? One time, help them with basic tasks in life such as, furnishing their apartment, driving them to hospital visits, teaching english, taking them a meal, getting their children registered in school, and any other thing you can think of. Have your family or small group adopt a family and support them as much as possible. Serve them and they will see Jesus through you, so when they ask, “why do you help me,” you can respond with the gospel message of how God wants a relationship with them. 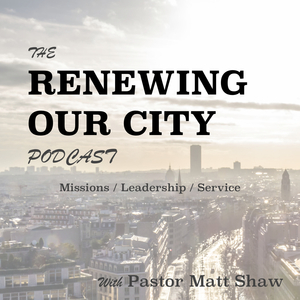 In the Renewing Our City Podcast Episode 3, Joshua’s first interview talking about his calling in life, his personal story, and how they are reaching people in Kenya, Africa. Habitat for Humanity builds homes so everyone can have a decent place to live. The post Episode 4 : Joshua Ngao on Reaching Refugees in Your Community appeared first on Pastor Matt Shaw.